Together, these two factors speak to how necessary accurate product identification is in the form of date codes, lot codes and batch codes to track and trace ones’ product from start to finish in the event of a recall. Two common automated marking and coding solutions for food packaging is continuous inkjet and laser coding. 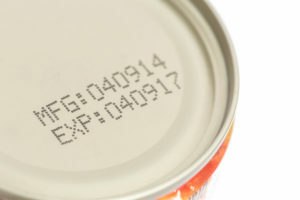 Accurate batch, date and expiration codes are essential for customers and retailers alike. If a production line performs multiple changeovers for different products on various shifts, this can leave room for labeling errors. Many CIJ and laser printers have features for storing unique, variable messages with icon-based interfaces that can be operated without extensive training for message creation and retrieval. With reliable and accurate coding methods, the production lines will remain running smoothly and will help in any situation where there is a recall. Coding and marking equipment geared towards food packaging must keep up with the ever-changing demands that are placed on the food industry. The food industry continually faces more stringent regulations, complex packaging technology, broader product assortments, and other challenges. The good news is, Griffin-Rutgers is also keeping up with the changes, and our marking and coding equipment continues to evolve to keep up in order to deliver the speed and accuracy that the food packaging industry demands. Because of the vast nature in the food industry, there is quite a variety of marking and coding technology solutions available. It’s the role of the production manager to look closely at their current equipment and future requirements to accurately gauge what will deliver the most value to their lines. Some determining factors include packaging material, production speed and the complexity of the code required that will ultimately determine what is the most suitable marking and coding solution for any given production environment. Take bread packaging for example, the correct solution will vary depending on where the code is to be applied and the material on which it will be applied; either on a bread bag or tag on the closure. A non-contact solution like CIJ can be employed for coding onto bags once filled with no risk of compromising the integrity of the product or the packaging. In comparison, the tag coding will depend on material – an adhesive closure tag can be efficiently coded using a TTO printer, while the plastic lock style closure, when colored, may be ideal for laser coding or TTO when a white lock is used. Another example, cakes & biscuits, often come in trays or wrappers which can be coded before the product is packaged. Since breathable packaging can pose an immediate issue due to ink migration, labelling methods such as TTO and print & apply labelling are suitable alternatives as they remove the risk of ink-based contamination. With so many variables to consider, it’s important that managers evaluate current and future production expectations. The selection of the right coding and marking printers can prove instrumental when it comes to maximizing the run time in the food industry. Posted in Food & Beverage, Food Labeling, Printing, Coding & Marking.